If you are around “energy workers” and/or “mental health workers” long enough you will hear this term repeatedly. It does not necessarily refer to other people. Boundaries are all about YOU. People can only do or treat us the way that we let them, and equally if we are complacent in our own boundaries – then the chances are that we won't recognise other peoples boundaries or “lines in the sand”. The by product of poor boundaries, is hurt feelings and spending a lot of time reflecting on what/why/how/when. Until we understand and work on our own boundaries we may lose a lot of valuable life time hours reflecting and wondering why people “can be so mean”, or “why we feel so bad”. If you have no boundaries yourself – it is very difficult to recognise when another person is outlining to you what theirs are. You may also find yourself continually reflecting on what you did or didn't do that might have warranted what you feel is an “excessive reaction' to something you said or did. The other side of the coin of having loose boundaries is that if we haven't put them in place on a physical level -then other people around us will be “stepping over” ours and potentially hurting our feelings and we may spend a lot of our time feeling hurt and uncared for, (which isn't the case). By creating healthy boundaries on the physical plane we can create a greater balance and stability in our lives. Well the thing is – what transpires on one level, does indeed transpire on another level. If you recognise that your boundaries are “ a bit loose” as reflected by your environment, then they are no doubt “ a bit loose” on a spiritual/emotional level as well. You quite possibly pick up on other peoples feelings and energy, and say “I'm an empath – I can't help it!”. The reality is – yes you can help it! If you DO want to make stronger spiritual and emotional boundaries, to protect your own aura from picking up “unwanted energy”, and also to prevent yourself from projecting your energy onto innocent “others”. Then you may find some of the techniques and explanations valuable. I am aware that the empath feels that “they can't help it”. With all respect – I would like to put to them for consideration that the inference here is that they can't control their own auric levels and levels of energy transfer. If they trust in the DIVINE process, understanding that Divine energy is infinite then all things are possible and anything can be done, and the ONLY thing blocking them from achieving this possibility is the perception that they have no control. What we believe – we create. So therefore if an empath THINKS that they have no control – then this is exactly how things will remain until they choose to re-pattern their thought processes and accept that they are not a victim of DIVINE energy but rather their limiting thought patterns. They will then take responsibility for their boundaries and auric protection and function at a much healthier level within their physical relationships and interactions, and also within their spiritual energy activities such as healing and readings. I realise that some people will find this disturbing as the capacity “to feel another persons pain”, is how they establish their responses – particularly if they are “healers” or “psychics”. What I suggest is that they look at their methods of communication and allow themselves an opportunity to stream line healthier forms for themselves and their clients. The above picture actually symbolises what they are doing in a “round about way”, they are pressing their auras up against the aura of the other person, to “FEEL' them (whether they are aware of this or not). I find this an interesting concept because a spirit of a person that has passed over and not been to the light can be referred to as a “negative attachment” or a “negative entity” when they do this kind of behaviour, (but that of course is a whole different scenario and story). Nothing I can put in here can do justice to the depths and variations of relationship boundaries, however, what I hope that this picture demonstrates is the "lines in the sand". If we are truly honest with ourselves - it doesn't matter how transparent and authentic we THINK we are, there are lines in the sand for various people. This image is the closest one that I can find to my own perception of circles/boundaries. So you will find that MY understanding of the subject is not quite the same as the person who defined the graphic that I have used. I could have created a new one to fall inline with what I perceive to be healthy boundaries, however, I believe that it shows you and opportunity on how YOU can design your own graphic. We are not ALL the same - if we were, it would be a boring old world. When you create your graphic - take ideas from the artist and from my own understandings and form your own circles/or boundaries. Draw the circles first and then put the names in of the people that you consciously KNOW fit into them. It will help you to identify who you want where. Bear in mind also that people come in and out of the "layers" or zones. 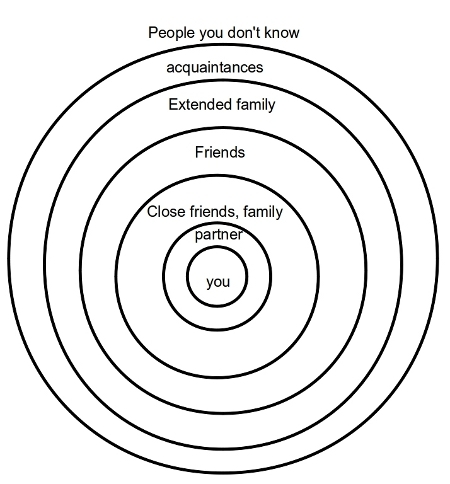 Sometimes someone in the outermost circle might end up shifting into the innermost, and depending on what has happened within personal relationships - some people that may have been quite close to your heart at one stage will find themselves out in the outermost or even floating somewhere in between. we are NOT locked into relationships. This is an exercise that you can do yourself . 1. Start by looking at the first circle. This is your inner sanctum - your sacred space, the core of who you are and your most vulnerable sense of YOU. In this sacred space you only let the people that you trust 100 per cent, to know anything and everything about you. They know your past, your present, your hopes, your dreams, your insecurities, your weaknesses, your strengths. In this circle - these people not only SEE you, they HEAR you, the LISTEN to you, and they KNOW and understand YOU at a core level. For some people - there is NO one in this circle. For others there maybe only one or two people. 3. The next circle refers to people that you regard highly and trust - they are consistent in their support and friendship. This might be your siblings that you get along with well, and it might be a professional counsellor or therapist with whom you feel comfortable to speak about the real "You", and the conditions etc that you are addressing at any present time. 4. This circle is for colleagues and friends that you interact with regularly and enjoy their contact and conversation. you meet on the same page and you have a lot of common goals. 5. these people are ones that you know and are still evaluating where you want to place them in your friendship circles. 6. These are people that you are interacting with and are "withholding your discernment on". You don't know them well enough to form an opinion of whether you are happy to maintain contact or whether to draw them closer to you, or to put them on the most external parameters of your circles of friendship. 7. These are people that you have not met yet - or people that you have and you want to maintain a distance from because to have them too close to you causes you discomfort, and you are not at ease in their presence. Have fun working out and establishing where the people that you know fit into your circles! You will find it a very interesting and enlightening exercise! It might look easy but when you get started it can actually take longer than you would initially thought. This is a way of reflecting on your current relationships in a more "clinical" and less emotionally attached way than you normally would. Bearing in mind that emotion can cloud our capacity to to see clearly and make healthy "judgement calls" or discernment within our relationships - this activity can be VERY helpful! 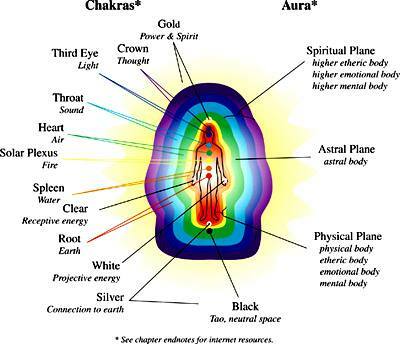 This is diagram of course refers to the aura and chakras, however this really is just another case of boundaries. If we think of it as we all have the spiritual body - this picture reflects the final layer of it in the layer of purple, but there is still energy radiating out from the "auric body" in the form of the golden colour. Someone that is an empath will pick up by standing close enough to have their yellow merge with the yellow of the person that they are reading. If they move a little closer then there will be an energy transfer in the purple layer, the blue, green etc.. the closer they move to each other - the more there is an energy transference. If a person is an empath and it is affecting their capacity to function in their own lives effectively - because they take on board other peoples grief and pain etc, or even their anger, then they need to work on their boundaries and the etheric cords. If they must do the "pressing against auras" to get insight and information (which is often how psychics and healers start to understand energy and "getting messages") then perhaps they could consider how to minimise the transfer. If you look at the diagram at the top of the page, (the circles Your space/their space), then you see the little "shared energy" space. this is a much healthier place to share - you don't take on too much of the other persons energy and it makes it easier and quicker to "cleanse and clear"